TRH The Duke and Duchess of Cambridge and HRH Prince Salman bin Hamad Al Khalifa, the Crown Prince of the Kingdom of Bahrain, have today officially opened McLaren Automotive's new £50m production facility in Rotherham. The facility on the Advanced Manufacturing Park (AMP) in Rotherham is the supercar manufacturer's second only production facility and the first outside its native Woking. Those present to witness the occasion were invited representatives from Sheffield and Rotherham Councils, senior local stakeholders and the 50 employees already employed at the 75,000 sq ft facility. CEO Mike Flewitt invited the Royal guests to jointly unveil a carbon fibre plaque. First announced in February 2017 and backed by a grant of up to £12m via the Sheffield city region (SCR), construction commenced just five months later. A six month fit-out followed. The in-sourcing of the manufacture of the carbon fibre chassis also increases the average percentage (by value) of a McLaren car sourced in the UK by around eight per cent from its current average of around 50% depending on model. Carbon fibre has long been a part of McLaren's DNA, the company having introduced the very first carbon fibre chassis into Formula 1 in 1981. Carbon fibre's innate strength and lightweight properties mean that the company has never made a race car, sportscar or supercar without it since. After seeing an example of a completed carbon tub, Mike Flewitt, McLaren shareholders and senior members of the company's executive toured the Royal guests around the facility. 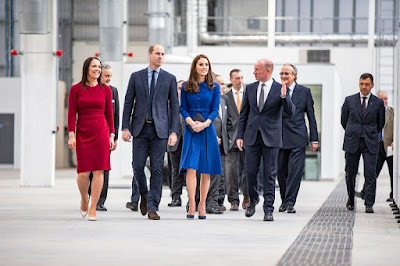 The Royal guests saw the process for producing carbon fibre tubs - currently in pre-production phase – from the cutting of the carbon fibre cloth, to the forming, pressing, machining and measuring of the final tub. Along the way they were invited to press the button to start the cutting machine, speak to some of the 50 or so people already employed at the site while McLaren Automotive Executive Director of HR, Mandeep Dhatt introduced several of McLaren's STEM ambassadors who work at the MCTC. Supported by the company, they speak to young people in the region to encourage them to take up careers in science and engineering. Mike Flewitt, chief executive officer of McLaren Automotive, said: "It was an honour for myself and all of the 2,300 people at McLaren Automotive to host The Duke and Duchess of Cambridge and His Royal Highness Prince Salman Bin Hamad Al Khalifa, the Crown Prince of The Kingdom of Bahrain, to officially open the MCTC and to show them the process we are innovating for the production of carbon fibre. They met some of the extraordinary, creative and passionate people we already have working here who are making that ambition a reality. "It is an important milestone for us as a ground-breaking, innovative car company and allows us to tap into the great energy, vitality and skills this part of the world has to offer. What goes on here at the MCTC will be vital for our ability to make good on our intention to continue to develop and unveil cars that are lightest in class; it is my belief that Britain – through facilities like this - can become a world leader in lightweight materials technology that will help create more efficient future vehicles. "We are proud to be bringing new jobs to the Sheffield region which has a long association with advanced materials; first with steel and now a future to look forward to with carbon fibre innovation and production for McLaren."